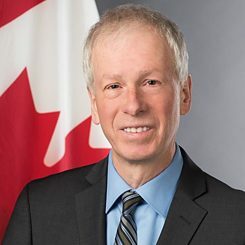 An Interview with Stéphane Dion "A Common Vision"
In June 2017, former Minister of Foreign Affairs and Leader of the Liberal Party of Canada Stéphane Dion presented his credentials as Canada’s Ambassador to Germany and Special Envoy to the European Union and Europe. In this exclusive interview, Ambassador Dion shares his first impressions and reflects on the relations between Germany and Canada. You have been in Berlin for several months now. What are your first impressions of the city? Is there anything that has especially caught your attention when you first arrived in Germany? Stéphane Dion: To me, Berlin seems to have the advantages of a big city without any of its disadvantages. It has a fantastic culture, and the traffic isn’t too bad. Also, my impression is that people aren’t too stressed out. Berlin is a wonderful place to live and I am looking forward to getting to know it better. Berlin is one of the cultural centers of Europe. Which cultural event are you most looking forward to during your term and why? The cultural calendar of Berlin is extremely impressive and I already had the chance to take part in a number of very stimulating events, such as the gala of the GreenTec Awards where Canada was partner country. I have been to the Staatsoper and participated in a street hockey game with refugees at Tempelhofer Feld, just to name a few. Regarding upcoming events, I am really looking forward to the Berlin International Film Festival Berlinale. It is a great opportunity to have access to Canadian talent and help to promote it internationally. Our Embassy at Potsdamer Platz will be an official venue again this year. I am excited to see great German, European, Canadian and other productions and co-productions side-by-side for us all to enjoy. I enjoyed the International Literature Festival, which included for example a reading by author Madeleine Thien and also Canada’s participation at the Reeperbahn Festival in Hamburg as country of honour. Of course I am naming but a few cultural opportunities. Berlin has such an extensive independent art scene, which I strongly encourage all – locals, Canadians, all visitors – to experience. How is your German language study progressing? Do you have a favourite word? I am sure many will agree that the German language is not easy to learn, however, a fascinating one to study. So, the motivation and interest is definitely there! What makes it interesting is that while in some cases the similarities to English and French are striking, however in others it is totally different, no link whatsoever. And even more, I am aware that you have to watch out for the false friends: a « Fehler » is not a failure, but simply a mistake. But rest assured, I am continuing my lessons, I have a new “Lieblingswort” every day and perhaps our next conversation will be solely in German! In addition to your position as ambassador to Germany, you have been appointed special envoy to the European Union. What does this mean for you and what are the challenges that you see in combining the two roles? As Prime Minister Justin Trudeau’s senior diplomat to Europe, I am playing an overarching role in advancing Canada’s interests throughout Europe, ensuring coherence across the activities of Canadian diplomatic missions and pulling together Canada’s pan-European efforts. For example, with CETA now in provisional application, I look forward to further strengthening economic ties, creating prosperity and market opportunity for both Canadians and Europeans, under an unprecedented progressive and socially responsible framework. As the Ambassador to Germany, I am working to strengthen the strong friendship between Germany and Canada, key not only to advance our goals in Europe but in fact, across the globe. Canada, Germany and Europe are facing issues that know no borders – migration, protectionism, terrorism. It is through collaboration and strong partnership that we can best address them. I am lucky enough and grateful to be supported by an incredible team here at our embassy in Berlin, at our embassy in Brussels, really, at every one of our European embassies but also by Canada’s capital – Ottawa. The relations between Canada and Germany are considered to be excellent. Which aspects do you consider to be the most important in the relationship between the two countries? Canada and Germany are close and our political and commercial partnerships are stronger than ever. Germany of course, with its economic importance on the European continent, has considerable influence over global issues. And Germany’s leadership role will only be strengthened with the departure of the United Kingdom from the EU. Not only an essential player and partner when it comes to questions of security, Germany is the current president of the G 20 just as Canada prepares to assume the presidency of the G7. Both of our countries are active members of the international community, sharing a common vision and liberal values, which are the foundation of our solid transatlantic relationship. These solid ties are the guarantee that our bilateral relationship will continue to flourish.